"Chevrolet will produce an all-electric version of the Spark minicar for selected U.S. and global markets, including California," Jim Federico, Chevy's global vehicle chief engineer for electric vehicles, said at the company's Detroit headquarters on Wednesday. The electric Spark will debut in 2013 and its global rollout will be similar to that of the plug-in electric hybrid Chevy Volt, he said. 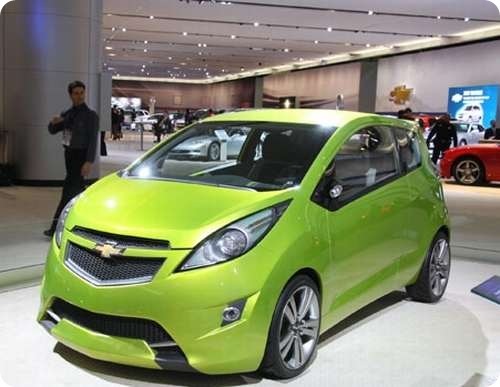 The gasoline-powered Spark is now sold only in China, India and South Korea. It is scheduled to be introduced in the United States and other markets next year. Electric cars have been slow to catch on. In the U.S. market, demand has been held back by the lack of models to choose from, skimpy infrastructure for charging the vehicles, high sticker prices, and low gasoline prices compared with other industrialized nations. News of the electric Spark comes after an August announcement by GM that it would build a Cadillac ELR luxury electric coupe and continues the company's push to seize the mantle of "greenest automaker in the world" from Nissan and Toyota Motor Corp, which makes the popular Prius hybrid car. *Image is from 2011 minicar. 1991 gmc jimmy 2 door v6 4.3L twin turbo help!